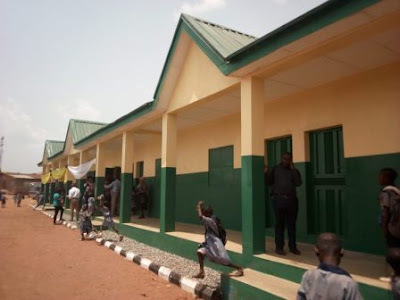 As part of giving back to the communities where it operates and its Corporate Social Responsibility (CSR), Nestlé Nigeria Plc on Thursday inaugurated some Educational Sustainable Projects Facilities at the Nawair-Ud-Deen Primary School, Owode Egba, Ogun. The projects include a renovated block of classrooms, comprising of head teacher’s office, Primay 3 and 4 classes. It repainted, refloored as well as re-roofed classrooms and corridors. Also, a toilet block of eight units, hand washing stations, Borehole with 2000 litres overhead tanks on steel platform with Gasoline Generator, playground with games facilities and football post were inaugurated. Speaking at the event, Mrs Victoria Uwadoka, Nestle’s Corporate Communications and Public Affairs Manager, said: “The NUD Primary School is one of our schools for Nestlé for Healthier Kids School programme. “It is where we teach them further to eat well, hydrate well and play well; they are part of healthy living and growth. “We are happy today that the school now has these facilities, good toilets, playgrounds and importantly, classroom building, water and hand washing stations. Mr Kehinde Keefa, Head Teachers, N.U.D Primary School, commended Nestlé for the project. According to him, the project has contributed immensely to the overall development of education in Obafemi Owode Local Government Area (LGA) as the school has been transformed to a model primary school in Owode Egba community. Keefa said the projects would also play a vital role in effective teaching and learning interplay as well as make the environment conducive for both learners and teachers. The Executive Chairman, Ogun State Universal Basic Education Board (SUBEB), Alhaji Abdul-Jeleel Okewole, represented by Mrs Jokotade Agbatiogun, Deputy Director, Education Quality Assurance, also commended Nestle for the projects located in one of Nestlé’s areas of operation. She said the gesture was a challenge to well-meaning individuals and organisations to give back to their communities in an enviable way as demonstrated by Nestlé. “I am convinced that the children, parents and school authorities who are the ultimate beneficiaries of this laudable projects will appreciate the gesture and effectively use the facilities to enhance teaching and learning. “However, the board implores the (School Based Management Committees (SBMC) to judiciously utilise and ensure that the projects are well secured and preserved for continuous use,’’ Okewole said. Responding, the traditional ruler of the Owode Egba, Oba Kolawole Aremu Sowemimo, called on government at all levels to make education a priority. According to him, these facilities provided by Nestlé Nigeria should have been the primary concerns of governments for all schools in the country. He urged organisations, well-meaning individuals and politicians to pay attention to the education sector. The traditional ruler encouraged the learners to make good use of the facilities, be dedicated in their studies and be committed to becoming honourable and respectable citizens.